Get a relatively quick overview of big-picture thinking in digital marketing by reviewing the items here. You can also select each of the images to view individual pages for each item. 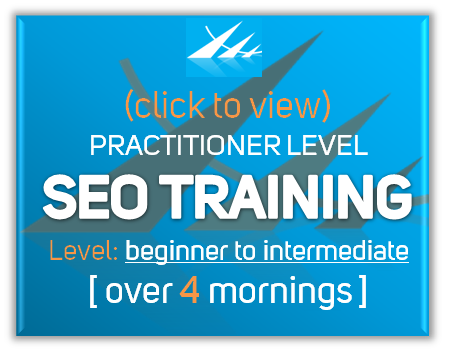 The first three topics – inbound marketing, marketing technology and content marketing are macro-level items. 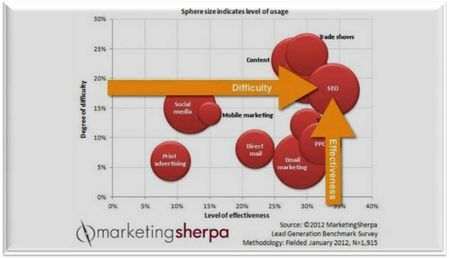 The remaining six areas are high level containers for stages in your online sales process. Bear in mind that the reason you might create a digital strategy or engage a digital channel such as SEO, Google AdWords, email marketing, social media etc…. is to deliver on the goals of each of these stages. 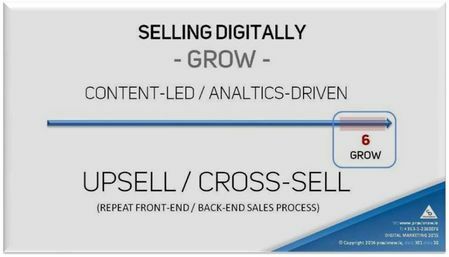 So making each digital channel work is not an end in itself; you want to see it work in the context of this digital selling process. 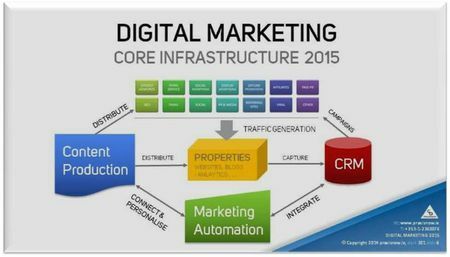 Your digital marketing technology infrastructure can be all encompassing – but this is not achieved overnight. Integrating the right marketing automation solution with your CRM system, coupled with an effective content production capability are key success factors in many of the most effective marketing organisations. 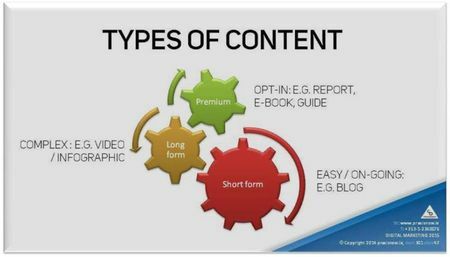 Content Marketing is not new, but the processes used to implement it effectively are. Only in recent years has sufficient experience evolved to define how best to set-up for content requirements definition, content production and cross-channel deployment / distribution policies. Used in the right way, content marketing can be managed at a velocity that suits you, is not over-burdensome on your resources, and can deliver both direct sales and brand impact on a consistent basis. The first stage in your digital sales process is to attract potential customers to your digital properties – usually, your website. But it’s not just visitor traffic you need, it is visitors who are realistically capable of buying from you. Whether that’s a million-euro sale or an instant online purchase, your content needs to be an evolving magnet for potential buyers. Attracting potential buyers to your website is one challenge – what you do with them is quite another. 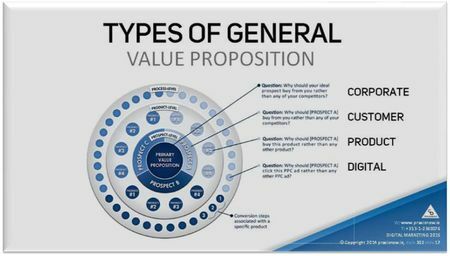 Your goal at this stage in your process is to engage your buyer with a proposition and delivery method that aligns to the stage they are at in the relevant “buyer cycle”; to keep their attention and interest until you land a compelling value proposition. 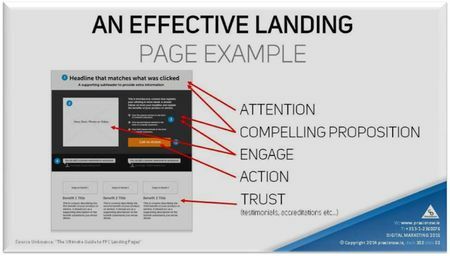 The LEAD CAPTURE stage is the transition that occurs from a website visitor who is anonymous to a personally identified, often early-stage qualified, sales prospect. But a visitor will not identify themselves lightly. This can only be accomplished on the back of a compelling value proposition that is clearly aligned to the needs of your target persona. Once you have captured a sales lead, you are now in control of future touch-points with that prospect. Being careful not to abuse your contact frequency (often determined by sector), your goal during the NURTURING stage is to develop a reputation, over time, of being a consistent provider of value to your prospect – not a hard sell at every opportunity. Some policy rules can help here. 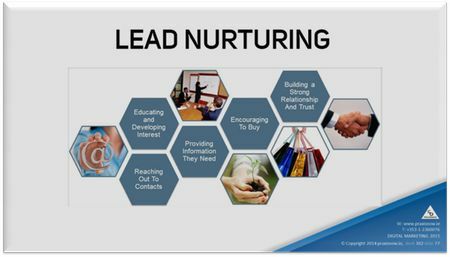 During the nurturing stage, as you provide continual value to the leads you have generated, you will be attempting to move prospects to the next logical step in your mapped sales process. 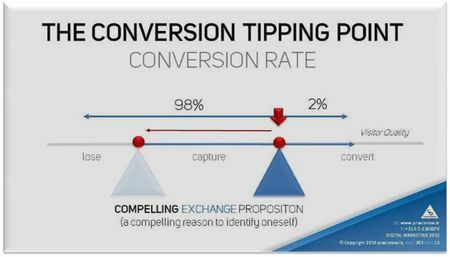 Each step moves a prospect closer to conversion. However, it is often the case that micro-steps in your process will be bypassed, so there should always be an opportunity to convert at any stage in the process. Successfully acquiring a new customer, whether through lead nurturing or in an offline context, is only the beginning of your relationship – the “front-end” sale. Your next goal is to generate a “back-end” sale either through up-selling or cross-selling. 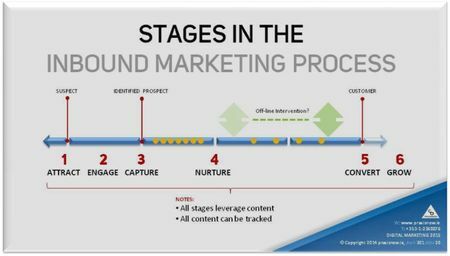 The process to achieve this is exactly similar to your front-end nurturing process but with a new value sequence. Being a consistent provider of value will ensure that you achieve the advocacy / referral objective you should also have.